Plan and Lofting? Right. The plan for the Harbor Skiff is drawn full size, to save you time. The plan consists of a single page...only it's about 14' long and 3' wide, because she has been drawn full size and all construction details are included. That means there is no lofting required so you can get right to the building. The Harbor Skiff is considerably larger than our other skiffs. In fact, she's 12' long with a 5' beam, and complete with floatation chambers. 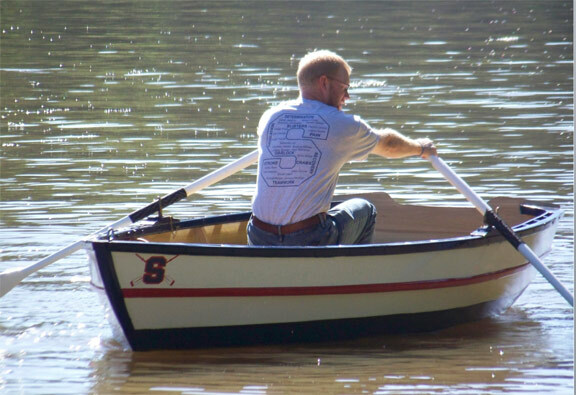 She's a pretty thing with her round sides, much like our Dory Skiff. This particular plan doesn't show floatation chambers, but when they are wanted, they are readily added under the fore and aft seats. This boat is a real load carrier, and with ballast forward will easily handle up to a 9hp outboard, though personally that amount of horsepower is completely unnecessary. 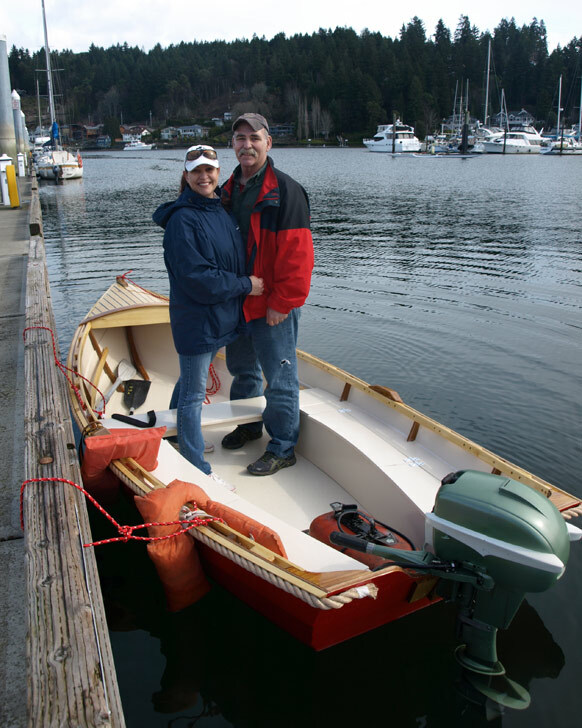 Here's a shot of one built by Hilmark Boats out on Vancouver Island, with the crew that built her testing her out on launching day. Four adults in a skiff? Obviously she can handle the load just fine. Don't assume that a Harbor Skiff is only suitable for salt water. 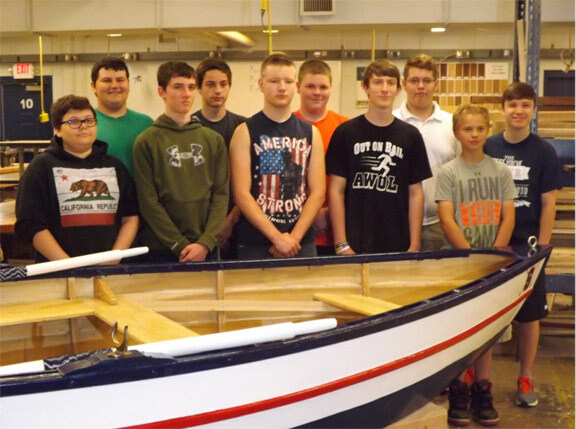 Students at Parkersburg South in West Virginia built this Harbor Skiff for use as a chase boat for their crew team. 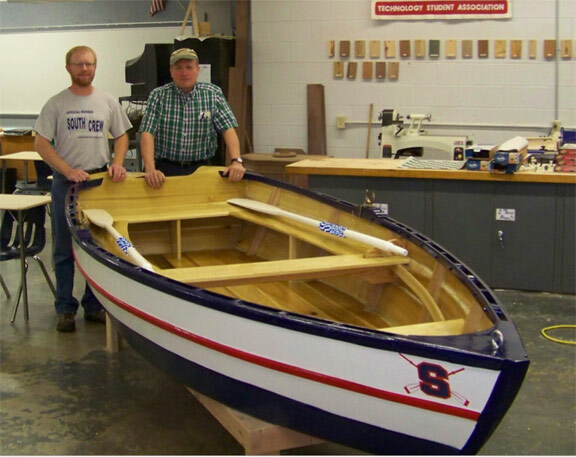 Teacher Carl Brainard (below right) wrote, "Thought you might want to see our boat. 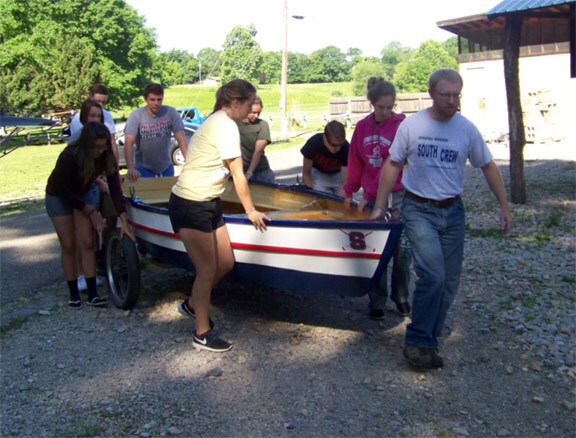 It is going to be used as a chase boat for our crew team. They row up the muddy Little Kanawha River and the Ohio River. Mr. Womack is their coach and he tried the boat out today. We launched it where the crew keeps their long boats on the Little Kanawha River this morning. We worked on it a little bit at a time in our tech-ed class for over a year. I imagine that I would starve if I had to build these things for a living However, I think I could go a little faster with the second one." And here's another launching day photo, this one taken at Gig Harbor,WA. Lovely job by builder Greg Richmond of Sound Craftsmen Construction. When you place an order for plans, understand that what you are purchasing is the construction rights for one time use only–and every plan page is so marked. A royalty amounting to 50% of the original cost of the plans is due on subsequent boats built from our boat plans. So if you decide you would like to build a second (or third, or fourth) Harbor Skiff for example, where the plans cost $85, then the royalty would only amount to $42.50 per boat.